The number of smartphone users is increasing on a daily basis. As the technology and internet connection speeds of smartphones increases, more and more users are browsing the web through their mobile devices. Google has noticed this trend. That is why it has decided to make changes to its search algorithms. With the new update, Google search results will give more preference to websites that are mobile friendly. You need to make changes to your website so that users can view it on their mobile devices without any errors. Otherwise, the Google update can end up penalizing your website and you will notice a drop in your rankings. The only way to protect the rankings of your website from a drop or a penalty by Google will be to ensure its design is optimized for mobile devices. You can make use of the tips given below to create the perfect website for smartphones. In a mobile friendly website, the homepage should help the users get hold of the content they are looking for. This means that the navigation capabilities of the home page should be excellent. The call to action links and buttons should be prominent. The menus should be short and easy to understand. For smartphone users, time is a crucial factor. They rarely have the time to stop and search for the content they want. By implementing a search facility, you are ensuring that they stay on your website longer as they can easily find the things they need. The search bar should be prominently visible. Add filter functionalities to help users narrow down their search and get the information faster. Users want the minimum of hassles when they are in the mood to purchase. Therefore, make the process smooth. Avoid asking the users to signup right in the beginning. Such popups should occur at the correct time. The call button should be placed in an easily accessible location. After all, your customers may want to ask you questions before making a purchase. For mobile device users, filling up a form is one of the most difficult processes they encounter on websites. It can be difficult to type in a lot of information on smartphones especially when the users are on the move. If calendar functionality is required, ensure that it is a visual one. Use real time validation techniques so that data entry becomes easier and it improves the user experience. Usability is one of the biggest issues with a mobile website. Your visitors want the minimum of effort when browsing your website. Avoid implementing the need for zoom on a mobile website. It is an extra and unnecessary action for users. In the same way, users do not want to switch between browser windows and tabs when using a website. 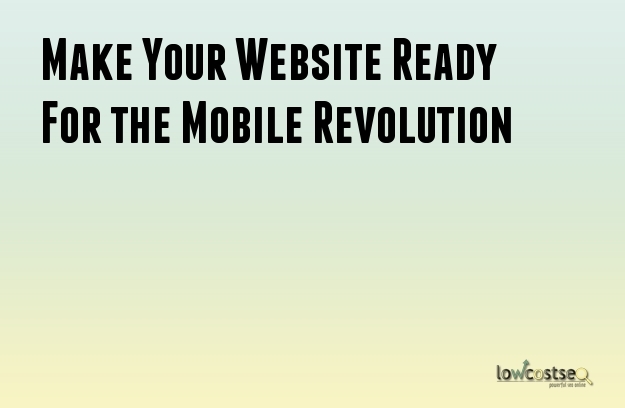 Mobile websites are only going to become more popular with the passage of time. The current technology trends point to such an outcome. Therefore, you need to ensure mobile compatibility for your website before it becomes too late.